The most obvious nonverbal indication of contacting is how you position yourself in relation to other people. This includes both how close you are to them and the angle at which you face them. You should always try to turn your entire body toward them while at the same time positioning yourself in front of them, judging by wherever they are facing their chest and shoulders. By placing yourself right in front of them, you can easily nonverbally contact with them , which is ideal. I wonder if the writer wrote correctly in the expression "judging by wherever they are facing their chest and shoulders", because I think people can't face their chest and shoulders. Can you explain it for me? In my opinion, the author's wording is a little awkward, but understandable after a moment. The verb face can be used with things that don't actually have a (human) face. The thing needs to be or have a "front" part. So when two people stand so that their chests and shoulders face each other, the chest and shoulders are more or less parallel to one another. They look like this. Their entire bodies are toward each other and in front of each. Notice that their faces are facing one another, but their bodies are not. They are not positioned like the two women above. B's body is partly facing A's body, but their chests are not facing one another. judging by wherever they are facing their chest and shoulders. 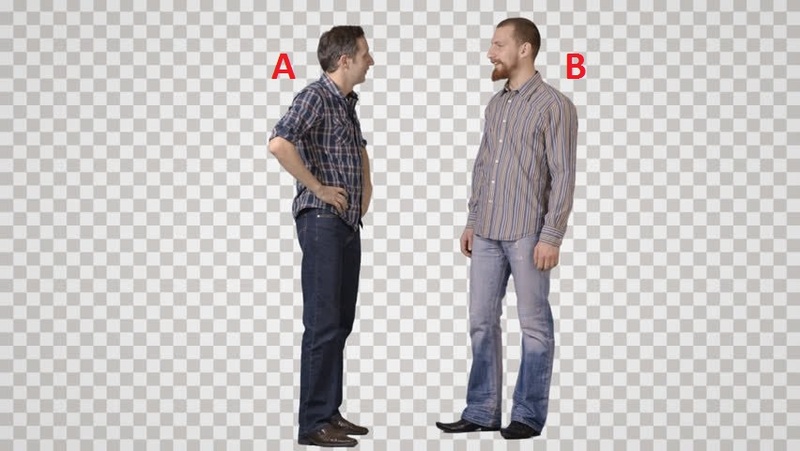 If B wanted to follow the author's advice, then B would use A's chest and shoulders to determine where he (B) should move/stand so that his body is in front of A and so that their chests are parallel. Then they would be facing each other like the women above. In the phrase "wherever they are facing their chest and shoulders", the author is using "face" in the military sense, where it means "to turn in a particular direction". It is used in this sense in military commands like "Face left/right" (turn through 90 degrees left/right), "About face" (turn through 180 degrees), etc. So the meaning is "judge which direction the upper part of their body (chest and shoulders) is pointing towards (i.e. not necessarily the same direction that their head is looking towards, or where their feet are pointing) and stand in front of them in that direction". Perhaps the author wanted to convey the meaning that you should place yourself where their body is facing, not where their head is facing? "Facing their chest and shoulders" does sound a little clunky. It is all too easy to ignore someone by turning your head away. By placing yourself directly in front of their body, this makes it impolite for them to do so. It doesn't really matter if your body is not facing them. You can always turn to face them directly if they engage you in conversation. The sentence is saying that you should position yourself "wherever they are facing their chest and shoulders." To face in a direction is to point toward it. So, if I am facing my chest and shoulders toward you, that means my body is pointed at you. So, the author is directing you to move to wherever the other person's chest is pointing. Not the answer you're looking for? Browse other questions tagged meaning-in-context verb-usage or ask your own question. What does this “their” mean? What does “go berserk” and “go wild” in this paragraph? What does “in two months’ time” mean in this paragraph? What does “meaner” mean in this paragraph?